When Seymour was nominated for Governor in 1862, Navy Secretary Gideon Welles wrote that he “has smartness, but not firm, rigid principles. He is an inveterate partisan, place-hunter, fond of office and not always choice of means in obtaining it. More of a party man than patriot. Is of the Marcy school rather than of the Silas Wright school, — a distinction well understood in New York.”7 Seymour trained in the legal and military arts but practiced neither, instead serving first as an aide to Governor William Marcy and then as legislator from upstate New York. 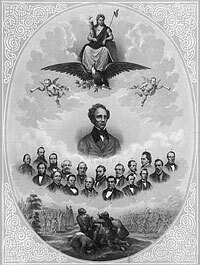 “Shortly after his speech for conciliation at Tweddle Hall in Albany, Seymour accepted the empty honor of standing as the candidate of the Democratic caucus for senator,” wrote biographer Mitchell.16 The Senate seat being vacated by William H. Seward went instead to Ira Harris, who was the compromise case of Republicans unable to choose between William Evarts, who was the candidate of Republican boss Thurlow Weed, and Horace Greeley, who was the anti-Weed candidate. Later in 1861, Seymour ran for Attorney General as a Democrat and lost to a War Democrat running on the Union ticket, Daniel S. Dickinson. Civil liberties and the suspension of habeas corpus became a central campaign issue. 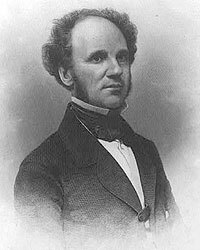 “Horatio Seymour and other Democratic leaders hence met a large response from independent voters when they made the arrests a major issue of the fall campaign,” wrote historian Allan Nevins.28 Historian Stewart Mitchell noted: “In the autumn of 1862 the Democrats of New York City were united for the moment because their defeat in the mayoralty election of 1861 had robbed them of patronage, the perennial reason for their quarrels. As often as they held office they fell into feuds over the spoils. In 1862, however, the two great factions in the city composed their differences and put up a fusion ticket, backed by Nelson J. Waterbury of Tammany, and Fernando Wood of Mozart Hall. As a consequence of this truce Wood went to Washington as a representative in the Congress, and Seymour carried the city for governor by 31,309.”29 Seymour carried the state by approximately 10,700 votes. 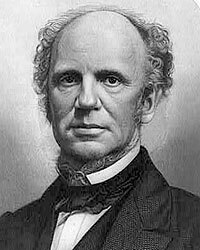 In December 1862, Thurlow Weed was at the White House when President Lincoln asked him to deliver a message to Governor Horatio Seymour of New York: “Governor Seymour has greater power just now for good than any other man in the country. He can wheel the Democratic party into line, put down rebellion, and preserve the government. Tell him for me that if he will render this service to his country, I shall cheerfully make way for him as my successor.”34 Thurlow Weed said he went to Albany and repeated the conversation to Governor Seymour.35 Seymour, however, said he wanted to act “as an irreconcilable and conscientious partisan,” reported biographers John G. Nicolay and John Hay, who thought Weed exaggerated President Lincoln’s intent.36 Moreover, the two Lincoln aides were not Seymour admirers. Fellow-citizens: In your presence I have solemnly sworn to support the Constitution of the United States with all its grants, restrictions and guarantees, and I shall support it. I have also sworn to support another Constitution — the constitution of the State of New York — with all its power and rights. I shall uphold it. I have sworn faithfully to perform the duties of the office of the Governor of this State, and with your aid they shall be faithfully performed. These constitutions and laws are meant for the guidance of official conduct and for your protection and welfare. The first I find recorded for my observation is that which declares it shall be the duty of the Governor to maintain and defend thesovereignty and jurisdiction of this State — and the most marked injunction of the Constitution to the Executive that he shall take care that the laws are faithfully executed. These Constitutions do not conflict; the line of separation between the responsibilities and obligations which each imposes is well defined. They do not embarrass us in the performance of our duties as citizens and officials. I shall not, on this occasion, dwell upon the condition of our country. The power and the position of our own State had been happily alluded to by my predecessor. My views upon this subject will be laid before you in a few days in my Message to the Legislature. This occasion, fellow-citizens, when official power is so courteously transferred from the hands of one political organization to those of another holding opposite sentiments upon public affairs, is not only a striking exemplification of the spirit of our institutions, but highly honorable to the minority party. Had our misguided fellow-citizens of the South acted as the minority of the citizens of our own State (a minority but little inferior in numbers to the majority) are now acting in this surrender of power the nation would not now be involved in Civil War. After the servant returned and announced that the President would receive us, we sat for some time in painful silence. At length we heard slow, shuffling steps come down the carpeted stairs, and the President entered the room as we respectfully rose from our seats. That pathetic figure has ever remained indelible in my memory. His tall form was bowed, his hair disheveled; he wore no necktie or collar, and his large feet were partly incased in very loose, heel-less slippers. It was very evident that he had got up from his bed or had been very nearly ready to get into it when were announced, and had hastily put on some clothing and those slippers that made the flip-flap sounds on the stairs. Governor Seymour and President Lincoln had come into conflict in mid-May when Seymour criticized handling by General Ambrose Burnside of the arrest of former Congressman Clement Vallindigham — which has led to orders from President Lincoln of his expulsion through Union lines into the Confederacy. “I do not hesitate to denounce the whole transaction as cowardly, brutal, and infamous. 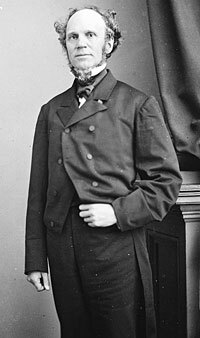 Unless the case shall assume some new aspect, I shall take an early public occasion to express my views upon the subject.”61 Seymour sent a message to the Democratic mass meeting that was called in Albany to protest the Vallandigham case. In a letter read at the rally, Seymour said: “I cannot attend the meeting at the capitol this evening, but I wish to state my opinion in regard to the arrest of Mr. Vallandigham. It is an act which has brought dishonor upon our country. It is full of danger to our persons and our homes. It bears upon its front a conscious violation of law and justice.”62 The meeting produced a series of resolutions which were transmitted to President Lincoln by Congressman Erastus Corning. Mr. Lincoln’s reply is considered one of his most distinguished state papers. Aided by President Lincoln, Republican Congressmen Reuben E. Fenton of Chautauqua County defeated Seymour by a narrow margin of about 7,000 votes. Biographer Stewart Mitchell contended: “In spite of the common belief that Seymour was defeated for governor in 1864 because of what was supposed to be his attitude toward Lincoln and the Civil War, it is probably that his failure to secure a third term was owing chiefly, if not wholly, to his having alienated powerful support within his party by certain acts connected with state policy.”85 Mitchell cited as contributing causes the intra-party feuding over the New York City police board and railroad franchises in the city. Noah Brooks, Washington in Lincoln’s Time: A Memoir of the Civil War Era by the Newspaperman Who Knew Lincoln Best, p. 166-167. Allan Nevins, The War for the Union: War Becomes Revolution, 1862-1863, p. 302-303. William B. Hesseltine, Lincoln and the War Governors, p. 297. William Howard Russell, My Diary North and South, p. 9-10. William Howard Russell, My Diary North and South, p. 9. David M. Jordan, Roscoe Conkling of New York: Voice of the Senate, p. 14. Sidney David Brummer, Political History of New York State During the Period of the Civil War, p. 445. James G. Randall, Lincoln the President: Midstream, p. 292. James G. Randall, Lincoln the President: Midstream, p. 292-293. Stewart Mitchell, Horatio Seymour of New York, p. 224. Stewart Mitchell, Horatio Seymour of New York, p. 225. Sidney David Brummer, Political History of New York State During the Period of the Civil War, p. 117. Sidney David Brummer, Political History of New York State During the Period of the Civil War, p. 118. Stewart Mitchell, Horatio Seymour of New York, p. 231. Stewart Mitchell, Horatio Seymour of New York, p. 228. Stewart Mitchell, Horatio Seymour of New York, p. 229. Stewart Mitchell, Horatio Seymour of New York, p. 239. Stewart Mitchell, Horatio Seymour of New York, p. 240. Sidney David Brummer, Political History of New York State During the Period of the Civil War, p. 217-218. George Fort Milton, Abraham Lincoln and the Fifth Column, p. 119. Stewart Mitchell, Horatio Seymour of New York, p. 248. Sidney David Brummer, Political History of New York State During the Period of the Civil War, p. 235. Allan Nevins, The War for the Union: War Becomes Revolution, 1862-1863, p. 317. Stewart Mitchell, Horatio Seymour of New York, p. 283-284. Chauncey M. Depew, My Memories of Eighty Years, p. 23. Stewart Mitchell, Horatio Seymour of New York, p. 256. Sidney David Brummer, Political History of New York State During the Period of the Civil War, p. 257. Stewart Mitchell, Horatio Seymour of New York, p. 259. Thurlow Weed Barnes, editor, Memoir of Thurlow Weed, Volume II, p. 428. Don E. And Virginia Fehrenbacher, Recollected Words of Abraham Lincoln, p. 464 (from Albany Atlas and Argus, April 16, 1864). John Hay and John G. Nicolay, Abraham Lincoln: A History, Volume VII, p. 12-13. William B. Hesseltine, Lincoln and the War Governors, p. 282. Sidney David Brummer, Political History of New York State During the Period of the Civil War, p. 255-256. Stewart Mitchell, Horatio Seymour of New York, p. 262-263. Stewart Mitchell, Horatio Seymour of New York, p. 264-265. Sidney David Brummer, Political History of New York State During the Period of the Civil War, p. 258. Stewart Mitchell, Horatio Seymour of New York, p. 268. Sidney David Brummer, Political History of New York State During the Period of the Civil War, p. 259. Sidney David Brummer, Political History of New York State During the Period of the Civil War, p. 260. Stewart Mitchell, Horatio Seymour of New York, p. 271. Sidney David Brummer, Political History of New York State During the Period of the Civil War, p. 261. Stewart Mitchell, Horatio Seymour of New York, p. 298. Roy P. Basler, editor, The Collected Works of Abraham Lincoln, Volume VI, p. 145-46 (Letter to Horatio Seymour, March 23, 1863). Chauncey M. Depew, My Memories of Eighty Years, p. 27-28. Sidney David Brummer, Political History of New York State During the Period of the Civil War, p. 263. Abraham Lincoln Papers at the Library of Congress. Transcribed and Annotated by the Lincoln Studies Center, Knox College. Galesburg, Illinois. (Letter from Horatio Seymour to Abraham Lincoln, April 14, 1863). Stewart Mitchell, Horatio Seymour of New York, p. 276. Stewart Mitchell, Horatio Seymour of New York, p. 278. William B. Hesseltine, Lincoln and the War Governors, p. 285. Stewart Mitchell, Horatio Seymour of New York, p. 277. William B. Hesseltine, Lincoln and the War Governors, p. 286. 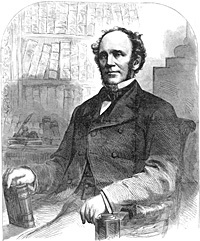 Rufus Rockwell Wilson, editor, Lincoln Among His Friends, p. 331-333. Stewart Mitchell, Horatio Seymour of New York, p. 293. Mark E. Neely, Jr., The Last Best Hope on Earth, p. 127-128. James G. Randall, Lincoln the President, Springfield to Gettysburg, Volume II, p. 295-296. Stewart Mitchell, Horatio Seymour of New York, p. 295. John Hay and John G. Nicolay, Abraham Lincoln: A History, p. 356. John Hay and John G. Nicolay, Abraham Lincoln: A History, p. 357. Chauncey M. Depew, My Memories of Eighty Years, p. 29. Sidney David Brummer, Political History of New York State During the Period of the Civil War, p. 347. Sidney David Brummer, Political History of New York State During the Period of the Civil War, p. 322. Gideon Welles, Diary of Gideon Welles, Volume I, p. 395 (August 7, 1863). Allan Nevins, The War for the Union: War Becomes Revolution, 1862-1863, p. 525. James G. Randall, Lincoln the President, Springfield to Gettysburg, Volume II, (295). James G. Randall, Lincoln the President: Midstream, p. 293. Stewart Mitchell, Horatio Seymour of New York, p. 351. James G. Randall, Lincoln the President: Midstream, p. 278. Sidney David Brummer, Political History of New York State During the Period of the Civil War, p. 330-331. Allan Nevins, editor, Diary of the Civil War, 1860-1865: George Templeton Strong, p. 390 (January 5, 1864). Stewart Mitchell, Horatio Seymour of New York, p. 337. Stephen W. Sears, George B. McClellan: The Young Napoleon, p. 372. Stewart Mitchell, Horatio Seymour of New York, p. 260. Stewart Mitchell, Horatio Seymour of New York, p. 362. George Fort Milton, Abraham Lincoln and the Fifth Column, p. 223. Stewart Mitchell, Horatio Seymour of New York, p. 283.